Robert MacNeil joins Jim Lehrer to mark the 30th anniversary of their program and to discuss the journalism the two have practiced and the evolution of television news since the program went on the air in 1975 as the Robert MacNeil Report. The NewsHour returns to the town of Dwight, Neb. more than 20 years after it buried a Marine killed in Beirut. A West Virginia community continues to work through the pressures caused by a struggling steel industry. For those whose families entered the U.S. illegally, life in America presents challenges and opportunities. Paul Solman returns to the broom factory in Autaugaville, Ala. to see how free trade has impacted the town. Spencer Michels reports on the roller coaster economics that have marked the the dot com world. The NewsHour honors Robert MacNeil on his last night as co-anchor of the program. On the 25th anniversary of the program, MacNeil and Lehrer discussed the state of the program and journalism. 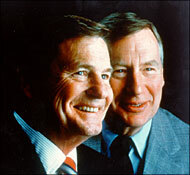 Robert MacNeil and Jim Lehrer team up to anchor PBS' Emmy-winning coverage of the Senate Watergate hearings. The Robert MacNeil Report is launched with Lehrer as Washington correspondent. A year later the program's title is changed to The MacNeil/Lehrer Report. The program expands to one hour, the first one-hour nightly newscast. Roger Rosenblatt becomes the first NewsHour essayist. David Gergen and Mark Shields provide weekly political analysis, launching a Friday night institution. MacNeil and Lehrer are named Fellows of the American Academy of Arts and Sciences. In partnership with NBC, The NewsHour provides gavel-to-gavel political convention coverage. Senior Correspondent Margaret Warner joins The NewsHour. MacNeil leaves the broadcast to pursue other projects. The program becomes The NewsHour with Jim Lehrer. The program's Web component, Online NewsHour, is launched. The Media and Health reporting units are created. Gwen Ifill and Ray Suarez join the NewsHour as senior correspondents. Jim Lehrer is presented the National Humanities Medal by President Clinton. MacNeil returns to help report on the aftermath of the Sept. 11 terror attacks. The Science Reporting Unit is created. Lehrer is selected to moderate his 10th presidential debate. Ifill is selected to moderate the vice presidential debate. Jeffrey Brown is named a senior correspondent.